A mudrā (Sanskrit: मु दा , lit. "seal") is a symbolic or ritual gesture inHinduism and Buddhism. While some mudrās involve the entirebody, most are performed with the hands and fingers. Mudrā(Sanskrit) is "spiritual gesture" and energetic "seal of authenticity"employed in the iconography and spiritual practice of Indian religionsand Taoism. (Wikipedia)Mudrās are arm, hand and body positions used in the traditions of Hinduism and Buddhism. The great Buddha knew the use of mudrāsand is often depicted using these ritual gestures. Various Kung Fuforms contain positions identical to these mudrās.108 mudras are used in regular Tantric rituals. 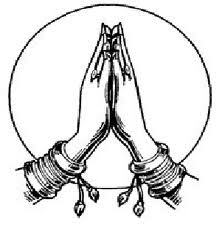 Mudras are also usedin Indian Classical Dance. There are over 200 mudras inbharatanatyam and over 250 in mohiniattam. The physical body is made up of five elements namely - Air, Water, Fire, Earth and Aakash (ether - the tiny intercellular spaces in the human body). Imbalance of these elements disrupts the immunity system and causes disease. Deficiencies in any of these elements can be made up by connecting one part of the body with another in a particular manner through Mudras. There is a direct relationship between the hands and the neck since the nerve paths run through the vertebral form in the arms, hands, and fingers. The flexibility of the hands always effects the flexibility of the neck. Therefore, hand exercises relieve tensions in the neck. Moreover, spreading the ten fingers creates a reflex that causes the chest vertebrae to spread out. The hands and fingers also have an additional direct relationship to the heart and lungs. many people can no longer properly stretch their fingers with increasing age. This shows tension in the heart area, which often indicates the prelude to heart disease or a tendency toward osteoporosis. This slightly crooked hand position also impedes inhalation. The result is that the optimum amount of air is not drawn into the lungs, especially into the lung borders, which promotes contamination in those areas. The hand reflex zones correspond to the foot reflex zones, the massage treatment of which is generally known today. Since some of the organs are only found on one side of the body such as the heart and liver, this is reflected in the hands. Since hands come in different sizes, you may not find the exact pressure point immediately. When you have found the desired point, massage it with your thumb, using light pressure and slow, circular movements. One to 3 minutes are enough. Mudras are sacred ritual gestures or hand positions. When used in religious dance they become an elaborate hand language. 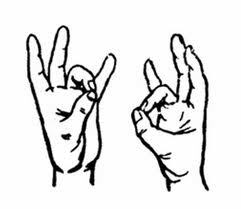 The Sanskrit word Mudra means seal. In the most antiquated times mudra was used with mantra and sealed the pattern of energy. 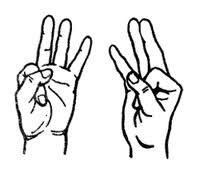 The earliest mudra was the Sanskrit symbol. From this primordial system of mudra grew a secret language that became as diverse as the country it was practiced in. Mudra is likewise used for the purpose of prayer. 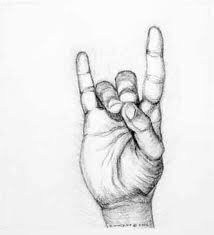 Mudra is a pattered movement mainly of the fingers that carries an idea or emotion. Mudras are a gesture language capable of expressing ideas and suggesting symbols. Mudras create an energy field and can be used in healing. The ultimate goal of mudra is a higher state of consciousness. In yoga these sacred hand positions relate to the energy flow of a particular meditation. They enhance the asana (posture) and sound current (mantra). Mudras in yoga are symbolic of mantras and send signals to the glands and to a specific part of the brain depending on the purpose of the meditation or yoga set. Colors influence our minds and our lives on every level. In color therapy, various shades of color are specifically applied to regenerate the organs and glands, as well as to activate the processes of elimination, respiration, and circulation. Colors also influence our moods and every type of mental activity. Black is the color of protection, of gathering strength, of retreat, and of the emptiness that already bears abundance within itself. There are no "bad" colors. Every color can also be seen in our aura or energy body. When a color gains dominance or is not in its right place, it will initially have an effect on the general feeling of well-being. With time, a health disorder may develop as a result. However, the course of an illness can also be reversed with the help of colors. You can have some beautiful experiences using color meditations. If you prefer a certain color, it may well be that you need the corresponding qualities. However, if you give too much preference to one color, this can develop into an addiction and the color may harm you. 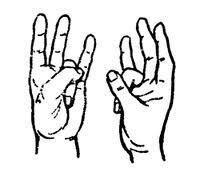 While holding a mudra, you can either visualize a color or concentrate on the color of an object. With visualization the color will then come to life. Gyan Mudra Gyan mudra is the most commonly used mudra in yoga meditations and meditations in general. Effective in cases of mental ailment, imparts happiness, the intellect develops, memory is sharpened. Enables one to communicate clearly. Gyana Mudra invites meditation, invites calmness and helps tune in to new awareness, knowledge and abilities. Helps with concentration. If we practice this regularly, it cures anger, hysteria, depression etc. Method Join the tips of the index finger and thumb and keep the other 3 fingers stretched and joined. Rest palms on the knee facing up during meditation. The tips of the fingers are centers for pituatiry and endocrine glands. 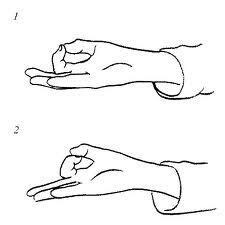 By doing this mudra, the glands work actively. Effect: Reduces physical weakness and gives strength. Gives skin a glow. Varun Mudra Improves the deteriorated quality of blood due to shortage of water & gives freshness to the body. Do you feel thirsty through the day? Do you feel dehydrated through the day? And you don't have diabetes? Then this mudra will help. This will balance the water content in your body and prevents all diseases due to your body parts and organs not being hydrated enough. It retains clarity in blood by balancing water content in thebody Prevents the pain of Gastroenteritis and muscle pains. Method Press the index finger on the base of thumb and keep the thumb on the index finger. Let the other fingers be straight. Shoonya Mudra Relief in diseases and pains relating to the ear. It relieves an earache within 4 or 5 minutesIt is useful for the deaf and mentally challenged, but not for inborn ones. It reduces the dullness in our body.One can practice it for 40 to 60 minutes daily until to be curedfrom the disease. Method Press the middle finger on the base of the thumb and keep the thumb on middle finger. Keep the other three fingers straight..
Keep the middle finger at the mount of Venus and press it withthumb. Surya Mudra Reduces weight of your body. Sharpens the center in thyroid gland. Reduces cholestrol, reduces weight and anxiety - also corrects digestion problems. Practice it daily for 5 to 15 minutes. Method Put the tip of ring finger at the base of thumb, with thumb gently pressing on it. Method Join the tip of the thumb with tip of little and ring finger. Keeping other two fingers straight. Method Join the tip of the thumb with the tip of middle and ring finger, keeping the other finger straight. The tips of the middle finger and ring finger touch the tip of thumb, while the index finger touches the base of thumb andlittle finger stretched out..Practice it as many times as you can. Heart patients and BP patients can practice it for 15 minutes daily twice for better results. Join the hands and tuck the knuckles of the thumbs into the notch in the center of the chest where the ribs come together. Exhale and inhale deeply. This mudra meditation will bring the knowledge of all the past present and future teachers to you. It is an opportunity to experience mudra, mantra and breath as a meditation. 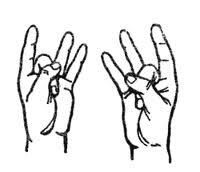 Prayer mudra neutralizes the positive (right or male) and negative (left or female side of the body. It stimulates the mind nerve, which is the only nerve that comes out of the mind. Prayer or Namaste Mudra is often used when blessing food, beginning prayer or tuning in before doing a yoga or meditation. It is the mudra to neutralize the nadis (subtle energy channels that link the charkas including Sushumna, Ida and Pingala Nadis). Buddha gave it his disciples for control of the mind. Sit in easy Pose with a straight spine and with the elbows bent, bring the hands up and in until they meet in front of the body at the level of the heart. The elbows should be held up almost to the level of the hands. Bend the index fingers of each hand in towards the palm. Join them with each other so they press together along the second joint. The middle fingers are extended and meet at the fingertips. The other fingers are curled into the hand. The thumbs meet at the fingertips. Note that the extended fingers point away from the body. Hold the mudra about 4 in. from the body with the extended fingers pointing away from the body. - Focus on the tip of your Nose. - Repeat the mantra of your choice 11 to 21 times. - Exhale hold the breath out. Benefits: This meditation will tranquilize the mind within three minutes. Place all the fingertips together. 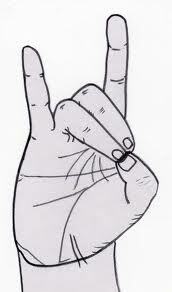 The Hakim Mudra can be practiced at any time. When you would like to remember something, or want to find the red thread again, place your fingertips together, direct your eyes upward, place the tip of your tongue on your gums while inhaling, and let the tongue fall again while exhaling. Then take a deep breath-and what you wanted should immediately occur to you. Moreover, when you must concentrate on something for a longer period of time, could use some good ideas, or want to remember something that you have read, this mudra can be useful. When doing mental work, don't cross your feet. Sit with your eyes facing west. This mudra can do true wonders, and you should always keep it in the back of your mind in case of an emergency. This finger position has been researched quite well; it has been determined that it promotes the cooperation between the right and left brain hemispheres. It is also recommended today in memory training. It opens access to the right hemisphere, which is where the memory is stored. 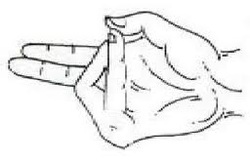 This mudra also improves and deepens respiration, and the brain profits from it as well. your right middle finger is on your left index finger, etc. Ganesha, the deity who overcomes all obstacles. Hold your left hand in front of your chest with the palm facing outward. Bend the fingers.Now grasp the left hand with the right hand, which has its back facing outward. Move the hands to the level of the heart, right in front of the chest.While exhaling, vigorously pull the hands apart without releasing the grip. This will tense the muscles of the upper arms and chest area. While inhaling, let go of all the tension. Repeat 6 times and then lovingly place both hands on the sternumin this position. Focus on the feeling in this part of your body. Then change the hand position: your right palm now faces outward. Repeat the exercise 6 times in this position. Afterward, remain in silence for a while. Once a day is enough..
Visualize the color red, a mosaic, a mandala, in various tones of red. Focus all of your senses on it for a while. Red should strengthen, warm, and widen your heart, giving you the courage to be open and confident.